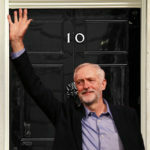 The results of the General Election are in, and they represent a tremendous vindication of Jeremy Corbyn and the Labour left, who have insisted since he was put on the ballot two years ago that Labour can and would make gains running from the left, and that there is a route to power that doesn’t involve triangulating the Tories, or compromising on key issues such as austerity. Jeremy Corbyn stood on a platform of investing in public services, standing up for workers’ rights, moving to a more just and fair foreign policy, and has been rewarded with a quite remarkable turnaround in the Labour vote. How remarkable? Well, with all seats bar Kensington declared (yes, Labour are in with a chance of winning Tory safe seat Kensington, which has gone to several recounts), Labour sit on 261, up 32 seats from the start of the election, with the Tories denied an outright majority on 317 – having lost a net 13 seats. Labour secured 40% of the popular vote, 10% up on Miliband in 2015, 11% up on Brown in 2010. Their vote share is higher than at any General Election in the past forty years except 1997 – meaning, as we pointed out was possible several weeks ago, Corbyn has outdone Blair in terms of vote share in not one but two of his elections – along with Miliband, Brown, Kinnock twice, Callaghan and Wilson twice.. Labour won over twelve million votes, three million more than under Ed Miliband. He has gained more seats than Neil Kinnock did in 1987, when he was allowed to continue as leader. The seats that Labour has won are remarkable in themselves. Student cities with younger voters proved crucial in Leeds, Sheffield, Derby, Portsmouth, Canterbury, Lincoln, Plymouth, Warwick, Reading, and Bristol. It was fitting that Nick Clegg should fall victim to a youth turnout surge. Labour even took Canterbury, a seat that has had a Tory MP since it was created in 1885 – when William Gladstone was prime minister. Many seats that were Tory safe seats in 2015 have become marginals, making a roadmap to victory in 2022 (or more likely, much, much earlier) very plausible. During the campaign itself, Jeremy Corbyn turned around a poll deficit of 22, to just 2. He inspired a historic turnout of young voters – as much as 72% according to some sources – with eye-catching pledges on tuition fees and a £10 minimum wage, which would hugely benefit younger, poorly-paid workers. What is for certain is that Corbyn is here to stay. Tom Watson, Chuka Umunna, Owen Smith and other leading critics all conceded on air last night that Corbyn would not be going anywhere. The surge of new left MPs, like Marsha de Cordova in Battersea, Lloyd Russell-Moyle in Brighton Kemptown, and of course the return of Chris Williamson in Derby North, mean that in future another candidate from Labour’s left might be able to make a leadership election ballot without charity nominations. Who thought this was possible? Several media outlets have pointed out that YouGov’s polling model, which predicted Labour gains and a hung parliament, has been proved right. But there are others too. The Labour Left for the past two years have had to endure ridicules, being told we represented the ‘loony left’, and that Jeremy Corbyn was unelectable, or that he would destroy the Labour party. That all seems ridiculous this morning. We have been vindicated. Labour’s manifesto will not be going anywhere. Our ideas can be developed and refined, but there will be no turning back the clock. We have waited years to have the opportunity to show what a Left-led Labour Party could do – and after such a historic night, we are not going anywhere. Why did so many pundits get the general election wrong? The entire Scottish Labour Party should be expelled. Dugdale’s Reactionary Alliance whereby Labour voters were instructed to vote Tory to stop the SNP cost us any chance of a Labour-led Coalition. Don’t be silly Robin, and besides she was misquoted (I’ve heard the original interview) and certainly was not calling for anyone to vote Tory. What a silly stalinist type of comment that is Robin, expelling a whole nation, where would they go, the Baltic? As for Dugdale she said nothing of the kind (I’ve heard the original interview where that came from btw). The repulsive Scottish Labour Party do not a nation make. What a night! One small correction though: the popular vote share was very slightly less (0.5%) than in 2001. I haven’t seen the breakdown, but no doubt the vote share in England is higher than in 2001–maybe even than 1997? What I think is even more impressive is that this is the first time since 1997 that Labour has gained seats. It should be remembered that just a couple of years ago the majority of the PLP with Harman as the acting leader, voted for continuing austerity. You wouldn’t believe that listening to the right now. And, is this still in the cards? The current Tory “voting majority” lash up with the DUP doesn’t look remotely “strong and stable” . There surely must be yet another General Election later this year. We could actually WIN the next one – but with a still massively entrenched irreconcilable neoliberalism entranced PLP Right/centre right majority and hostile Right controlled Party machine, and too many local Labour councils dominated by corrupt and/or careerist, Austerity implementing, family-based cabals , a Labour Party elected on a radical Left Keynsian manifesto such as the current one later this year, would be carved up and broken by internal treachery and market forces pretty much as quickly as Greece’s Syriza government was. Not a very cheery statement after a truly great night and morning that had all of us chortling with sheer joy and delight as the election returns came in . But we need to focus now on our continuing profound weaknesses as a UK political vehicle for real, sustained, opposition to the Austerity/privatisation agenda of the entire UK and global capitalist classes. A genuinely internally democratic mass Momentum has to be a key development in this transformation of Labour as a party . No sign so far of this happening at all. And as a side issue, I understand the excellent Party Manifesto wasn’t actually based on ANY of the worthless guff produced by the interminable National Policy Forum Commissions over the last few , fruitless years ! What a cynical waste of effort that process is. A fair statement. I do think (or at least hope) that most MPs will go along with Corbyn a bit more for the next few months; last night on TV we saw even the likes of Jack Straw grudgingly giving him credit. That said, many or even most would probably not be found reliable if/when a left Corbyn government ran into a fightback from capital. I could easily imagine large-scale defections to form a National Government should things like capital flight, a run on the pound, an investment strike, and/or plunging stock values start to occur. – Getting a process in place for selecting candidates in the event of a snap election. Snap elections are a fact of life and it is inexcusable for the party not to have a process in place which allows the members to choose who to run as an MP. – Preparing for Conference in order to try to democratise the party structures, or at least stop the right from getting any more anti-democratic measure through. – Restart the policy discussions, hopefully this time using the Manifesto rather than the dire policy statements as a base. It is true that there was much which was good in the manifesto, but there were also some things which were bad or missing. We need to talk about: getting rid of Trident (unlikely, I know), our stance on trade agreements and the WTO, nationalisation of energy (my personal hobby-horse), a detailed plan to fight climate change, bringing schools back under local authority control, eliminating prescription and dental fees, rolling back benefit-cuts, reducing VAT, the details of industrial democracy, etc. – Thinking how to bring the left-liberal Corbyn supporters over to socialist politics. The little-reported “Alternative Models of Ownership” report commissioned by John McDonnell could provide a start for this, despite its somewhat rosy-eyed view of co-ops. – Identifying key Blairite MPs to deselect. Realistically we don’t have the time to deselect all of the right-wing MPs and doing so would probably cause too much party disunity but we can at least target people like, e.g., Jess Phillips. I agree with the above list, but would add to the elimination of prescription charges and dental fees, the wholesale selling off of the NHS property portfolio, its profitable services, and the re-organisation laid out in the “Sustainability and Transformation Plans” that are being enforced with NO involvement from doctors, patients and the general public. The logic of John’s position, along with what he says later about capital controls, is that Labour would not be in a position to develop the policies and support needed to sustain itself in office for at least a year, and probably longer. I think he is probably right, but as many have pointed out the instability of the situation means that there could well be another election fairly soon, although that is something that Labour would have some control over. It is not necessarily a question of bringing down the government at the first opportunity, but rather of choosing the moment, when hopefully we will have made some progress with C. Mac’s excellent list of priorities and be in a better position to assume office. However, things will probably not work out quite so conveniently.. I agree with you, Peter Rowlands, that the current UK political turmoil is almost certain to result in a unprepared Labour Party (that is unprepared for the guaranteed immediate hostile global market response and internal party treachery ) winning a new General Election. Whilst we would all undoubtedly be utterly ecstatic on the evening and morning of the victory, we must, as socialists also anticipate that the internal and external market response such a victory simply WILL produce, will produce only two possible options for Jeremy and his team, ie, forward to ever more radical measures and mass mobilisation to combat economic sabotage and treachery by the Labour Right, OR the Alex Tsipras of Syriza route of utter capitulation to the wishes of the capitalist market. In the first route , ie, continuing on a anti austerity Left reforming path, my certain prediction is that a sizable portion of the PLP would decamp to form a “National Government of economic salvation” with the Tories and Lib Dems . History unfortunately will not wait whilst our Corbynite Left minority in the Labour Party “gets our act together” in defensive policy development and organisational terms – so the next General election will indeed happen with us as a Party in this dangerously unprepared state. There is no excuse for us on the radical (reformist) Left of the Party to be naïve and consumed with boundless “maybe it’ll all work out OK” false optimism about what is likely to happen next though. The very act of “winning” will split our “broad church” of a party asunder. As socialists we have to ideologically prepare for this, campaign to stop Jeremy’s team from eventually adopting the “Syriza route” to collaboration (and the resulting rise of the radical populist neo fascist Right) , and embrace the reality that eventually a smaller radical reformist Left Labour party would be likely to be left standing, without its current Right wing. Sorry Peter, I misrepresented your position in my reply , which actually suggests Labour could avoid taking office “prematurely” after another General Election “by choosing the moment” to assume office, when we are better prepared”. That would be great of course – but if Labour wins a majority, we will be the government – unprepared or not. And then my projected developments WILL result. If a section of the PLP breaks away to join a government of national unity there would be no Labour government, but my point was that it would not be in Labour’s interest to bring down the Tory government asap, although that might happen anyway.As for a government of national unity, Ramsay McDonald No. 2 is waiting in the wings! I suspect that your projection of the future is correct. In that context, something which we should be arguing for (although I know it will make me unpopular with some of the Old Left) is proportional representation. We need to do our utmost to bring that in before the party splits–which I think sooner or later it will. A broad church is all very well, but not church is so broad to be able to include atheists (to torture the metaphor). Otherwise we’ll face potential wipe-out due to vote-splitting, as in 83. McDonell has said he’s in favour of PR and Corbyn has at least indicated he’s not opposed to it, but it hasn’t particularly registered as a priority. Yes. A socialist party is not really possible without PR, but we haven’t won the argument for it in the LP yet, let alone the rest of the country, and Clegg’s stupidity over the referendum in 2011 makes achieving it even more difficult. Yes when the heard news there was to be a General Election I felt we weren’t ready. But Labour’s campaign in last 7 weeks under JC has been brillant and about left wing democratic socialist ideas and I have had the time of my life engaging with citizens re our ideas because we HAVE ideas to talk about! The Tories expected a landslide but having attended a JC rally in my city there were 4,000 (many students) at 4.00pm on a Monday afternoon in intermittent rain and we waited 1.5 hours I knew something was in the air, and I first joined Lab in late 70s and had never seen anything like this in my life! As a left wing democratic socialist I have always supported candidates whatever their hue – crumbs for working people or us wanting the table- but was left wondering, just imagine what if a significant number of Labour MPs had supported the decision of the members (twice) to endorse JC?. You discuss ideas in Labour by debates and votes and this settles things what was their problem? Things could have been even better. JC and Labour activists plus voters are STARS! Probably true, but the same may have been said about the Conservative Party. There is no reason, so far, to disbelieve Theresa May’s sincerity when she said there would not be a general election. It was reported at the time that Lynton Crosby had advised against it. As should talk that Labour could have done even better with another leader. The key asset that Corbyn has is that he is not part of old gang politics. This is clearly an international development and the USA and France alone show that conventional politics are deeply unpopular. But while involvement in government is a negative as the SNP are now finding, parties have to offer a credible alternative, and Labour did so at this election. There may be storms ahead, as May seeks to stitch up a deal with the DUP, meaning unremitting exposure of her incompetence is going to be essential. THe riots at Winson Green Prison in Birmingham last year were directly due to privatization policies persued while she was Home Secretary, and it was good to see the Party attacking the Tory record on policing numbers. There is potential here for a viable centre left alliance. However nothing will work while the Fixed Term Parliament Act is in place. WE now have five years of a shambolic government in prospect, and the priority must be to get the Act repealed. Labour’s front bench under Jeremy Corbyn now have the authority to do this. Footnote- I put in a 10 hour shift on Election Day and only 2 regrets. One – we turned around a 3k Lib Dem majority to a 4k Labour majority (a 7k turn around) but wish I could have got to 2 official marginals in my city to engage there with working class/working people and both lost by just 300! Second as a left wing democratic socialist I have supported right wing candidates so why couldn’t the right wing ‘great men and women of history’ do the same and from day one fall in behind JC? Left wing democratic socialist ideas are now driving the agenda but we could have done even better with this! The Tories probably all hate each other but unite for their class and their interests and bite their lips in public. The Tories got 42% and our progressive programme 40% a 9.5% increase in Labour’s vote based on our IDEAS. Wonder if these right wing Labour people had a rally in a park how many would be enthused to turn up? But in the end a slogan of some of the left has come true: MAKE JUNE THE END OF MAY! It is a rare moment of satisfaction for the left – we should enjoy it as it will all begin again on Monday. Still, Labour did lose some constituencies which will be bittersweet for the thousands of local campaign workers who had hoped for something different. What is extraordinary is that Labour still increased its vote considerably in every seat that was lost. Chris Leslie’s recent interview shows that the tiny period of silence from the ‘Party within a Party’ group has kick started again. Without offering any reasons that the adoption of his views would have actually won an election they continue to claim the right to ‘my constituents know my views’ argument for undermining Labour programme’s consensus. The point is though what do we do about it? The ‘Party has and needs a wide spectrum of views’ opinion is so entrenched among Party membership that administrative/disciplinary measures would tie the organisation up in years of hostile division without necessarily showing all the successes in the objective anyway. We have to continue the day to day political activities within and without the Party around the adopted manifesto to gradually isolate and replace the Chris Leslie’s time by legitimate deselections at the time for deselctions. An important part is therefore played by those CLPs which are being used as the vehicle for the promotion of ‘neo – liberalism’. There is surely no short cut to this. But those local CLP do need national encouragement and support to be successful in with that challenge if Socialists are to maintain the needed stamina. I am encouraged by the comments above, that the ” surely the majority of the PLP will now back Jeremy” , fantasy I’m getting from some comrades hasn’t convinced us here at least. Chris Lesley’s cynical , treacherous, statement is much more in line with the still dominant PLP viewpoint. The currently silent PLP majority are just awaiting some setback to re-start the undermining. In fact the Right quite obviously had been pre-booked to tour the TV studios this very weekend to kick-start the new Leadership challenge ! That gameplan is currently in ruins – but the objective stays the same. As C. Mac correctly says, in the event of a Corbyn electoral victory , there can be no doubt about that after the first inevitable attack on the UK currency by “the Markets”, and other acts of economic intimidation, many on the Labour Right will decamp to form a “National, Government” with the Tories and Lib Dems. There is no sign Jeremy or John have even thought about capital controls or any other defensive measures required by a reformist Left Labour government. Is there any evidence of pre-booked TV studios or as with the comments about expelling the Scottish Labour Party, do we need to take it that evidence of the allegation is irrelevant and we simply go into fantasy land? Some did plan on these lines, Frank Field was shouting about a separate Labour Party refusing the take the whip. But apart from Field, I have heard of nobody on the right doing any actually planning. So unless you can produce some evidence, lets simply start looking at what can be done to prepare for a TOry_DUP coalition and how to derail it. Which so far this site has not discussed. Dearie me, Trevor, you obviously simply haven’t been reading and watching all the sundry whispers and rumours and anonymous briefings spread across the entire media for the last few months or so since the local elections , on the very well signposted preparations by the Right for an expected Labour catastrophic defeat, and a new Leadership contest. Yvette Cooper and alternatively Chukka were also being whispered about as contenders. If you can’t keep abreast of all the goings on don’t expect the rest of us to keep you up to speed with selected annotated excerpts ! You need to keep up . The Labour Right have not “come on board the Corbynite Left Labour project”. If you believe so you are extraordinarily badly informed. thanks for confirming you have no evidence at all. If you are going to make statements that TV studios had been pre-booked, try finding a TV studio that had been pre-booked. As for naming people who were going to be the leadership contenders, Chukka has already made his position clear and it does not support the rumours. You are also inventing quotes. If anyone said anything about the Labour right having “come on board the Corbynite Left Labour PRoject” it was not me. Would you like to inform us who it was? The Project can make its own way and is doing quite well currently. Whether it can do so on the basis of believing gossip and innuendo is something else. Facts will decide the future and you do not have any. Meanwhile the TOry_DUP alliance is a real threat and as this site has noted, graffiti in the Province is allying May with the loyalist gunmen. That is evidence of a more sinister kind. Get Real. No, I fancy that since the election at least there is much more support for Corbyn, albeit on a pragmatic basis.However, it must be made quite clear that there can no longer be any place as a Labour MP for the likes of Chris Lesley, whose remarks were not only treacherous but completely daft, given the huge increase in the Labour vote. ( If we accept that this was more or less the same as 2001 then apart from 1997 this was the biggest share of the vote since 1970!) I think that most Labour MPs would recognise this, those that don’t should not be allowed to continue as MPs. I’m inclined to agree with Peter here, with the important proviso I made earlier. I think most Labour MPs don’t really believe anything much and are pragmatists. This means that they’ll go along with Corbyn if they think he can win, but there is a very good chance they would desert him at the first sign of a fightback from capital. That is why we need to develop in the party and unions the organisational capacity as well as the political awareness required to be able to face down such a threat. As Peter and John have rightly pointed out, it’s not at all clear we’ll be able to do this before the next election. To be honest, I’m not sure we’d have time to do it even if the parliament lasts a whole term. Syriza had been building this sort of capacity for decades and the membership still weren’t able to prevent capitulation, albeit against even tougher odds than Corbyn is likely to face. Incidentally, I came across a rather good documentary featuring Tony Benn explaining the challenges he faced as Secretary for Industry in the 70s: https://www.youtube.com/watch?v=4h9qv1HQ4w8. It would be good if we could get some CLPs or Momentum groups to watch it. I’ve been trying to figure out over the course of the campaign how to talk to people about the challenges a Corbyn government would face, such as those experienced by Tony Benn, while still convincing them that they should vote Labour. I don’t know if anyone has figured a way to do this? I would be wary of assuming much in the way of more support for Corbyn. Two of my nearest Labour MPs have made it clear in private conversations that they think the election success was achieved despite and not because of Corbyn. I think that their deeply ingrained “pragmatism” is actually an excuse for have no real ideas about deep social change and therefore of ruling out as “unrealistic” whenever it is proposed. I fear that the present round of humble pie eating will not amount to much. The PLP is still a long way from the membership. A good test would be to ask them if they support a reduction in the threshold of 15% required from the PLP for the election of the leader. I think that when the old issues resurface there will not be much difference in the approach of the majority of MPs. Most are unlikely to change their political philosophy on the basis of an admitted wrong prediction. The Progress website has as yet no commentary on the rise in Labour’s electoral fortunes. I guess they are really stuck. They don’t know what to say. But does anyone think they are currently reconsidering their political outlook? They have been humiliatingly proved wrong but we should not imagine that they will throw in the towel. They will be looking for ways to assert themselves again waiting for anything that can be construed as a false move on the part of Corbyn/McDonnell. You know I could’ve sworn that one of them…what was his name…Richard McKinnon(? ), was promising to be back on here on June 9th to gloat I Told You So after the election. It’s all gone quiet over there. In fact we can blame the PLP & co and their wrecking tactics for possibly costing us the election. I assumed McKinnon and the other little group of Tory trolls who were so active leading up to the General Election were simply pathetic , scripted, short term contract Trolls for some Tory black propaganda internet room. And all are now looking for more useful work ! We need to get JC supporters as delegates to Conference, have progressive resolutions and rule changes to democratise the party further to give more power to members. We also need to have selection meetings so members have a say in candidates next time and some argue there may be another election in October if not earlier. Perhaps this result has shown the beginning of the end of Neo-Liberalism in Labour and of ‘The Great Men and Women of history’ in Labour. No longer should members be treated like children – seen but seldom heard – and leaving things to careerist MPs who see themselves as the adults who think they know better. We had confidence in JC, so much so that we elected him twice! We need to reform Labour and Conference and get more left wing democratic socialist Labour PPCs and engage with citizens including young people and Community conferences in CLP areas on policy issues could help. Oh and as for the political imbecile Leslie I will invite him to my city to hold a rally and have already booked a telephone kiosk as his venue. With his position greatly strengthened, Corbyn must take on and defeat Labour’s nuclear mafia. The Labour manifesto had nothing at all to say on nuclear disarmament and did not challenge May’s willingness to start a nuclear war. NEWSFLASH : Labour now apparently has 800,000 members , with 150,000 joining over the last three days alone ! On to the first million ! As Chris Bryant would no doubt sneer “”just 800,000 , Liz Kendall could have built that dead easy “. oops , make that Chris Leslie, but could just as easily have been the equally smug, Bryant ! He has used the phrase ‘there is no magic money tree’ in the past and then he voted for Trident replacement. I hope he is replaced before the next election. John, as you probably by now have seen, that Newsflash was false and has been denied by Corbyn’s office. It is said to have originated in a Tweet from Aaron Bastani and was then re-tweeted by others. Estimates from Labour sources put the figure at 25,000 to 35,000. Impressive even so but not 150,000.
yes this is the figure from NEC sources, but it is early days. I expect there to be a higher surge in the rest of the month. Key question is how many do any work? In my CLP the very creditable extra 6000 came from a new candidate who worked his socks off and the team of activists who came together in a room that could only comfortably take 50 – less than 10% of the total membership. In Newcastle under Lyme which was a tory target a majority of less than 50 in a leave seat for a remain MP was due to him and his team who worked like Trojans. Yep, a load of codswallop that surged across the blogosphere and then into The Canary and then the Independent. A classic example of us all wanting it to be true, no matter how unlikely . The internet age gives wings to these “rumour as fact” in a way never possible before. Still, if we count the affiliated union members I understand the membership DOES stand somewhere around the 800,000 mark stated in that internet-powered hype.. Such interesting times we live in and I am so grateful to all of you here and all those others who have worked so hard in recent weeks, months and years to bring us to this strategic position. What an effort though to turn it all around. And looking ahead? Heartened and much elated though I am I hesitate to celebrate too much. I for one am in no doubt as to the immensity of the monumental task ahead if genuine socialist change is to be wrought in this fundamentally right wing country of ours and I doubt I’ll see it in my lifetime given my retired status and the degree to which the ‘right’ has infiltrated the PLP. I feel Winston Churchill had a very neat turn of phrase, coined for events long past, that succinctly sum up the ‘Left Labour’ position now. Clearly, “This is not even the beginning of the end – but maybe it is the end of the beginning”! Let us hope so! Great to see David Drew back. Corbyn must move now on Trident. He was clearly unable to say what he would have liked to have said because of the pro-Trident manifesto.